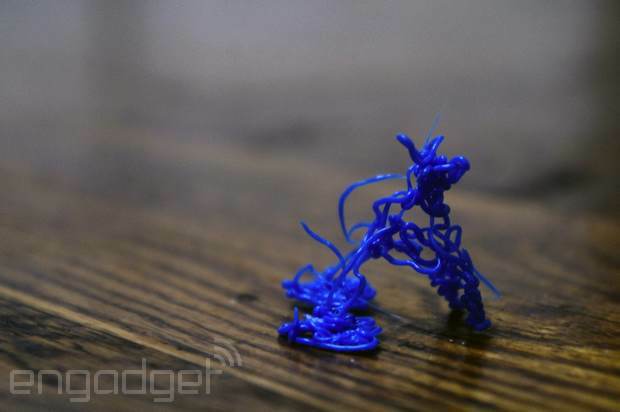 There's little doubt that 3Doodler's 3D printing pen is fun, but it's not strictly a precision tool; it's big, and mid-air drawing can get messy. Lix believes that pros need something more accurate, so it's crowdfunding a 3D pen of its own. The printer is about as slim and comfortable as a technical pen, giving it the kind of accuracy you'd need for air-drawn artwork and even some prototyping for architecture and fashion. It's easier to carry with you, as well -- Lix's device takes power from a USB port rather than a wall outlet, so you can draw wherever inspiration strikes. Lix has already met its funding target in just the space of a day, so an £82 ($135) pledge should get you the production 3D pen (plus some starter plastic filament) when it ships in December. That's decidedly more expensive than the $99 3Doodler, but Lix believes that the sleek design and professional focus merit the premium. You can judge for yourself by checking out the clip below.